The US stamp newspaper "Scotts Stamp Monthly," reports a set of nine stamps issued by Ethiopia in 2000. 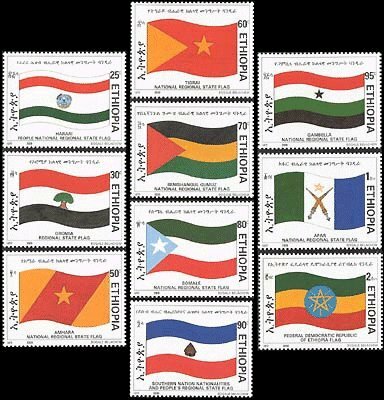 These stamps depict the flags of the regional states of Ethiopia. In addition, the national flag is shown on the high value of this set. 2- Gambella is upside down compared to that originally reported on FOTW - four bands of blue, green, white and red - instead of red, white, green and blue. At least the black star in over the white band. 3- The Afar flag shown here has the sabers less inclined, of lighter color, and more elongated, while the star is golden (not red) and straight up (not rotated to the fly). Not to say that one source is better than the other, but the stamps themselves are also issued by the government. The stamps in general are not always accurate, but most stamps are issued by the governments that sell them. On the other hand, stamps are typically issued by semi-autonomous institutions that, despite depending on the government, typically has autonomy in terms of stamp design. Of course, there are exceptions, and from what I know Ethiopia might even be one of those exceptions. In any case, I've seen so many inaccuracies in stamps, flag wise, that I'm quite reluctant to treat them as trustworthy sources. To me, stamps are more or less at the level of flag plates in Encyclopedias in what concerns reliability. Therefore I guess that caution is not unwise.